Oregon is investing in senior behavioral health to better meet the needs of older adults and people with disabilities by improving access to care and by making sure that providers work together to provide coordinated, high-quality physical and behavioral health care. The goal is improved quality of life for older adults. And over time, through sharing and adoption of best practices, the cost of care will actually be reduced. This investment places 25 professionals who specialize in behavioral health for older adults in local and regional community mental health programs. Their purpose is to build capacity in each community’s behavioral health system to provide the type of services older adults need. 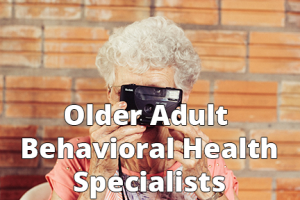 For a crosswalk that shows where older adult behavioral health specialists are located, in relation to ACT providers, to view the Behavioral Information Sheet, and/or to learn more about the program, click here.